There's been a bomb scare in the games village. New Delhi - Britain's Princess Diana may have died in a car crash in 1997, but New Delhi Commonwealth Games supremo Suresh Kalmadi thanked her for being at the opening ceremony on Tuesday.The blundering chairperson of the organising committee made the faux pas in a press conference to update reporters on the troubled Games' progress. "Yes, Princess Diana was there," he said before correcting himself. "Prince Charles and (Camilla) the Duchess of Cornwall. Now they have gone off and they appreciated all the efforts made here. "Kalmadi has been the face of the Games, but was booed at the opening ceremony after a shambolic build-up. Also a problem with bugs at various venues. Aussie men struggling in the pool. FFS, first we choke against the Bannies in the cricket and now the Poms and Scots are beating us in the swimming. 5 golds for us in the day. Not bad. How many golds do the Scots have? So i see Haroon is boxing for Pakistan after not being picked by England...a bit like Dirk Nannes in the 2009 T20 WC. Athletics events are due to start tonight but are in doubt because the track is not ready. Is the 100 metre track 100 metres? PMSL at the crazy Tunisian-born Aussie wrestler Bruce Esky...err...um...I mean... Hassene Fkiri, who lost his temper during his Gold medal bout with an Indian opponent. He was constantly warned and penalised for slapping and head-butting, then gave the bird to the crowd after he was finally (apparently correctly and deservedly) disqualified. He was stripped of his Silver and Chef de Spaghetti made him go and stand in a corner and think about what he'd done. skully on the 24 hour delay this time. You're right, this fiasco was embarrassing from an English standpoint. ; Our athletes have no right to expect other people (apart from themselves) to be be disqualified for false starts. Australia already has the disadvatage of having a smaller population from which to select its team, so the least we can do is let them set off a bit before the gun; it's only sporting. How many banindians does it take to change a light bulb at the CG? South African players have been coming to India for about 20 years now. I cannot really recall them complaining about the weather, food, pollution etc. nor can I recall them getting sick with Delhi belly etc. Mostly these things seem to be affecting the Aussies and UKers. Is this because the South African contingents which has a lot of white players / athletes are more used to to such conditions ? SA has had / still has a tumultous history, they still have slums and a noticeable have - have not gap. Does this allow even the whites to grow up in an environment which builds more immunity and also resilience to potentially adverse, non home conditions. Do the high standards of livings and ultra sanitized environments in UK and Australia make their athletes more susceptible ? I am not posing this question to stir up anybody, only wondering about this since there have been complaints about unfriendly conditions even at places like Barcelona and Atlanta. Child specialists say that it is best to let your child roll a bit in the mud so as to develop immunity, should athletes of some countries be put under different conditions as part of their build up ? I think some of the CG athletes are a bit pampered. And at almost every multi-sport event, there are complaints from somewhere that things aren't how [insert team name here] would like it. Might just be Aus and England's turn. Ironic, though, that the Aussie cricketers took defeat with more grace than some of our CG athletes. Then again, maybe they're getting used to it. 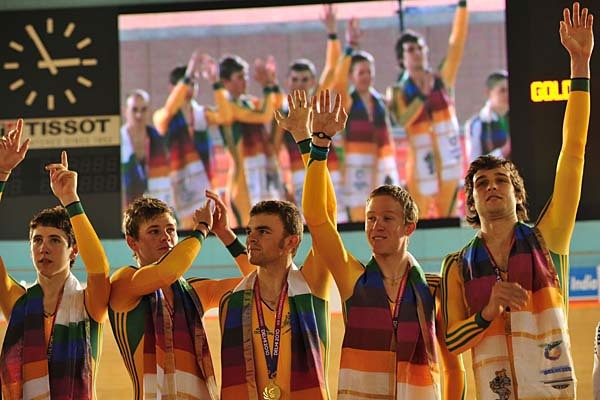 Meanwhile, the Australian primary school cycling team seem to have won the 4000m teams pursuit in a pretty fast time. Couple of them look very young particularly the second last one. Is there a minimum age limit at all ? Their nickname is the Flying Afridis. Josh Carney wrote: South African players have been coming to India for about 20 years now. I cannot really recall them complaining about the weather, food, pollution etc. nor can I recall them getting sick with Delhi belly etc. Mostly these things seem to be affecting the Aussies and UKers. Some interesting points Josh, but you are possibly slightly off the mark with you view of conditions in SA. I would say most countries have slums and a substantial have/ have not gap. On the whole is fairly sanitized with the exceprion of the rural areas but I would hazard to guess that this is the same in the Aussie outback. Aye, Saffers are actually renowned experts in the treatment of wet stuff. But there's a certain amount of 'stuff' in all drinking water and you do get immune to your own 'stuff'. Perhaps the saffer stuff is similar to the stuff in Indian water somehow. Although they are now saying that Aussies got sick from contaminated water in the warm up pool. Heard one of teh Aussie swimming team officials on the radio this arv, and he said they'd actually had fewer gastro-type problems at these CG then at any other major meet for quite some time, fewer than 10% of the team in total, which is about 'normal'.